139b Peppercombe to Westwood Ho! Standing above Peppercombe, we should have a wonderful view along the coast, but we had to imagine it. Mist. Damn mist! Looking at the grey beach below, I ask my husband if it is possible to walk along the shore, avoiding the ups and downs of the cliffs. It seems a long time since I walked along a beach, back in Bude. “It’s pebbly,” my husband warns. “Shingle is difficult to walk on.” And I wonder if the tide is going in and out (I forgot to check) and whether we risk being cut off, maybe even pressed up against foot of the cliffs with nowhere to go. There is a steep descent into Peppercombe, but I am disappointed at the bottom. My map mentions ‘Peppercombe Castle’ – but there is no sign of one down here, although we do come across an old ruin. My husband appraises it thoughtfully. He likes renovation projects but this one might be a bit too much for him! A long steady climb out of the valley, and we stop to eat a snack on a convenient bench. We would have a wonderful view back towards Clovelly, if only we could see through the mist. I can just make out the white houses clumped at the water’s edge on the distant shore. That must be Clovelly. There is no other village along the coast between here and Hartland Point. “The next section of shoreline is up-and-down,” my husband warns me. He has already walked this part of the coast, in order to meet me. “How many ups-and-downs?” I ask. “Four or five,” he says, but looks doubtful. “We’ve already done one.” I’m thinking of Peppercombe. A little further on and the path dips down to sea level. 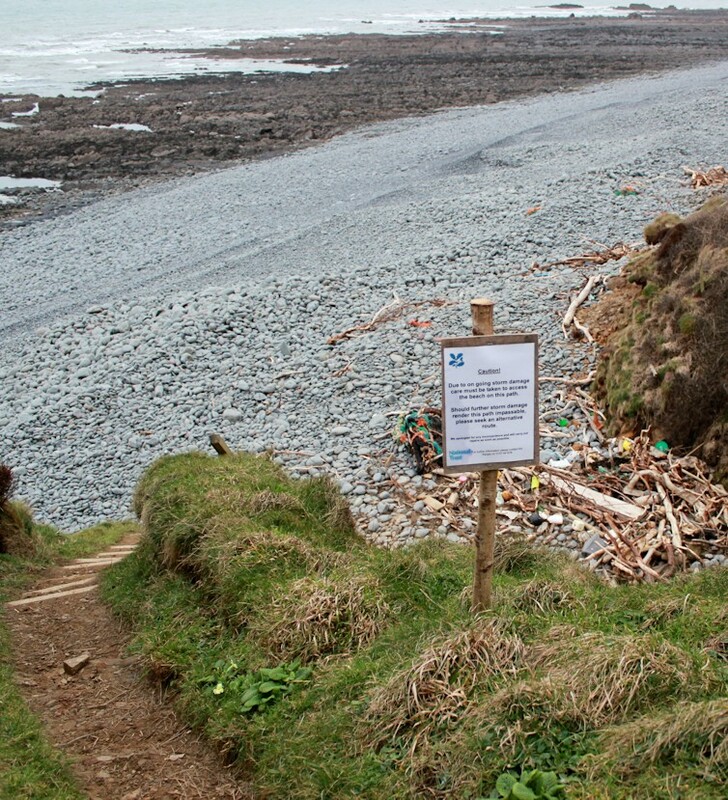 The actions of the winter storms are clearly visible, with huge chunks of driftwood cast up onto the beach and debris covering the path itself. I notice how large the pebbles are – boulders really – and am glad we didn’t try to walk along the beach after all. We climb up the next cliff. I think this is Higher Rowden. The path winds through gorse bushes and the views should be wonderful. But they aren’t. Down we go, into a valley carved by a tiny stream. At the bottom of the valley the path drops down to the beach. A warning sign advises caution due to storm damage. We can see a tangle of driftwood and other debris piled up against the bottom of the cliff. I look at the notice again and read it carefully. I look around for signs of an alternative route, but can’t see any. We are near the bottom of a steep-sided valley, with a stream running down the middle. No other paths. No sign of a bridge. The steps take us down to the beach and my husband is right, the bottom section of the steps is missing and we do have to jump down. I take a photo of my husband looking woebegone beside the missing steps. I wondered how he managed to get up here earlier. The stream disappears into the shingle rocks of the beach and we have a dry, but precarious, crossing over to where another flight of stairs leads up and out of the valley. 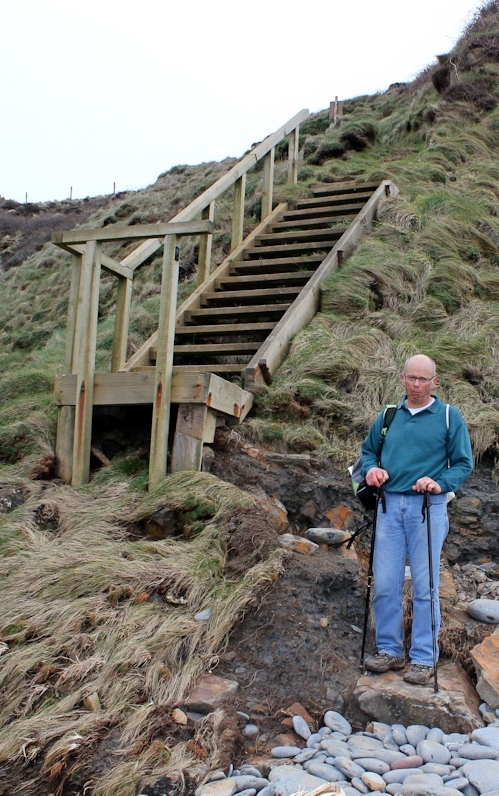 Luckily, these steps are undamaged. Walking across the stones is difficult. They are large and irregular and slip and slide under our weight. It seems to take a long time to navigate a few yards and I worry about twisting an ankle. At this point, I am very glad we didn’t try to walk along the beach. Before heading back up the cliff, I take another photo across the bay, looking back to Peppercombe and Buck’s Mills beyond. The clouds are sitting low on the hills and covering the woodland I walked through earlier. Climbing up onto Cocklington Cliff, we see the coast undulating before us. I am growing tired and pull out the map to work out how many more ups-and-downs. We have Green Cliff to come, Abbotsham and then Cornborough. None of them look too steep. Further along, I take a photo looking back to Hartland Point. I can’t see the lighthouse, but I can just make out Clovelly, on the far left. Green Cliff merges into Abbotsham Cliff. My OS Explorer map, number 126, ends at this point and so I pull out the next one, number 139. I take another photo, looking ahead. Somewhere hidden around the corner is Westward Ho! Across the bay I can make out the line of land stretching away to the north. According to my new map, the distant shoreline consists of Braunton Burrows and Saunton Sands, with Baggy Point and Woolacombe Sands beyond. The final headland is, probably, Morte Point. We pass over a little bridge and begin to meet other walkers. Must be approaching civilisation. Ahead is Cornborough Cliff. I take a final photograph back along the coast. Low cloud still sits on the top of the cliffs. The last stretch of the South West Coast Path runs along the route of an old railway line. It is straight, flat and has a packed earth and stone surface. We meet families out walking. To the right is a piece of National Trust Land called Kipling Tors, named after Rudyard Kipling. Westward Ho! is the only place-name in the UK to include an exclamation mark. It was built as a seaside resort in the second half of the 19th century, and took its name from a Charles Kingsley novel. With such a romantic sounding name I was expecting something very picturesque, but the reality turns out to be quite disappointing. The large house which dominates this approach is derelict and boarded up. The beach is grey and unfriendly looking. A holiday camp, consisting of rows of nondescript pre-formed statics, does not improve the place. We did, however, have a very nice meal in The Pier House, where the food was surprisingly good and the service excellent. A fantastic page detailing the geographical features of this section of coast, and illustrated with aerial photographs, can be found on the Open University Geological Society’s website. This entry was posted in 09 Devon and tagged england, hiking, photography, travel, walking. Bookmark the permalink. 16 Responses to 139b Peppercombe to Westwood Ho! Oh! This looks so lovely! I like walking around in cities when I travel but a coastal walking tour sounds really good. I hope I will get a chance to do this someday. Thank you for sharing your experiences! It’s a really wonderful experience. England’s South West Coast Path is fantastic. Did you manage a scone and tea at the tearoom on the green? They are fantastic. Hope you have some mist free walking next time. It’s so frustrating when you know you’re missing out on some fantastic views. 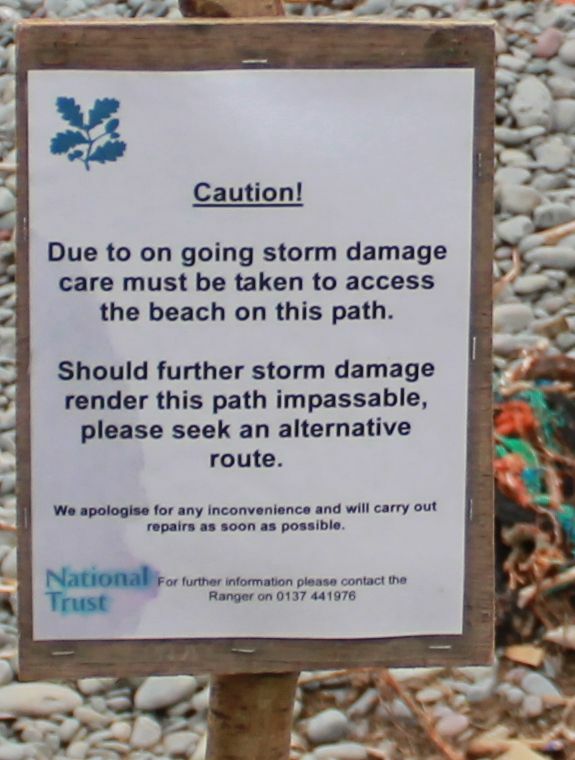 And definitely a good decision not to walk along the beach…..I got seriously grumpy with prolonged shingle tramping…!! What a shame about the mist. I’m glad you made it down those steps too. 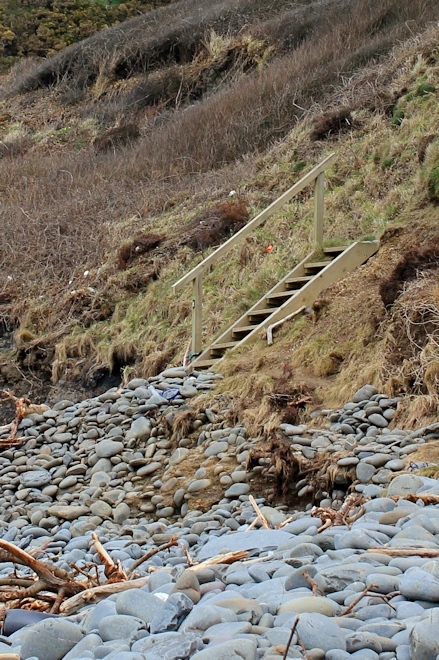 Poor old Devon and Cornwall suffered such terrible storms this winter, it is surprising there wasn’t more damage done. Westward Ho ..where I live is actually a lively up & coming place. Lot money been spent here to bring it into this century. The holiday parks are well used where lot’s re Holiday year after year it’s that poplar.Why you were so surprised the food was good amazes me..What we to yokel to be able to cook & eat proper here. The beach is a top surfing & kite surfing beach. Believe you me on a fine summers day it’s as crowed as any Spanish resort. Guess you would not like that.Many come from all over uk & indeed Europe to kite surf here. Sorry it was not a dreamy Clovely or Porlock Wier. Kinda glad you walked on by before you found anything else wrong with it..
Hi Alan, it is always tough when someone criticises your home town, so apologies if I caused any offence. I’m sure you will understand that I have to report things honestly, as I see them. The sands at Westward Ho! were lovely. But the approach as you walk along the coast path from the west is not pleasant. And the pub looked like a pile-em-high and serve-em-cheap establishment. Nothing wrong with that if you want quick grub, but it was a surprise to find the food was cooked with love and really good. 44 of you!? That was quite a group. It’s a lovely area of coast, but the walking is tough on the knees. If you go again, you should walk along Hobby Drive to Clovelly. It’s an easier walk and rather lovely in the woods. Thank you so much for the recommendation of the Pier house.